Mobile learning in U.S. higher education is rapidly on the rise. According to a study conducted by Educause, Sixty-seven percent of college students say they use smartphones or tablets for academic purposes, double the response just one year prior. So how can colleges and universities begin to evolve, and quickly, to deliver the information and services their students, faculty and future applicants need on the devices and platforms they’re using? Current students and potential applicants increasingly rely on their mobile devices for information. A responsive web design has been a necessity for years, and still many institutions don’t have one. Without a mobile website design, there is not only a void in the experience of your current students and faculty, but also for future applicants. Having a sophisticated and responsive web presence is as necessary as campus tours for attracting future applicants. Education is limitless thanks to mobile technologies. Fifty-two percent of college students reported using their mobile device to help complete an academic assignment at least once a week. However, only 3 out of 16 professors encourage students to do so and provide apps and resources for mobile. Both students and professors reported a desire to utilize smartphones and tablets more in their academic careers. Educate your faculty and students on apps and mobile responsive websites that can help them in coursework. 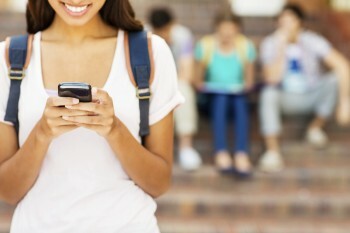 Tell us how you’re planning on bringing mobile technology to your campus this year?